Landing in the Macintosh group as a bitmap graphic designer was a lucky break for me, and one interesting part of the job was designing screen fonts. It was especially enjoyable because the Macintosh was able to display proportional typefaces, leaving behind the tyranny of monospace alphabets with their narrow m's and wide i's. The first Macintosh font was designed to be a bold system font with no jagged diagonals, and was originally called "Elefont". There were going to be lots of fonts, so we were looking for a set of attractive, related names. Andy Hertzfeld and I had met in high school in suburban Philadelphia, so we started naming the other fonts after stops on the Paoli Local commuter train: Overbrook, Merion, Ardmore, and Rosemont. (Ransom was the only one that broke that convention; it was a font of mismatched letters intended to evoke messages from kidnapers made from cut-out letters ). One day Steve Jobs stopped by the software group, as he often did at the end of the day. He frowned as he looked at the font names on a menu. "What are those names? ", he asked, and we explained about the Paoli Local. "Well", he said, "cities are OK, but not little cities that nobody's ever heard of. They ought to be WORLD CLASS cities!" 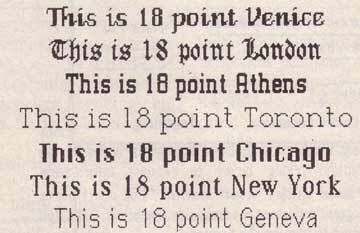 So that is how Chicago (Elefont), New York, Geneva, London, San Francisco (Ransom), Toronto, and Venice (Bill Atkinson's script font) got their names. Even today I think these are some of the finest bitmap typefaces ever created. Susan Kare must be so proud of herself and her role in the Macintosh user interface. I just read this story, and I had to comment -- I'm from suburban Philadelphia myself, having grown up in Jenkintown. I'm a student at Villanova, and I'm living off-campus in Bryn Mawr for the year -- although on the R5 Paoli/Thorndale line, I'm closer to the Rosemont stop than the Bryn Mawr stop. I don't know if these comments are still getting read, but just in case, I had two questions... First, does Susan remember which fonts were which under the original names? Second, which high school did she and Andy go to? I'm sure I'd know it, having grown up in the area. Been a Mac user all my life -- thanks to you guys for getting it started. Bill: The font 'Times' comes from England, not New York. I remember finding these on the System 7.1 "Fonts" disk way back when. They were in the "Apple Classic Fonts" folder, I believe. I have recently started a blog, the info you provide on this site has helped me greatly. There is obviously a lot to know about this. I think he did some good things in features also. Keep working, great job! Thanks for a very interesting blog. What else can I get that kind of information written in such a perfect approach? I have a company that I"m simply now operating on, and I"ve been on the look out for such information. I love reading all about business and innovation. Glad Susan and Andy inspired the world, bravely got jobs at Apple ànd started a revolution! Overbrook is a section of West Philly, I am from 66th Street. I attended Lamberton High School, then to St. Joe's University. Merion, Rosemont, and Ardmore are WORLD CLASS cities! Storytelling is one of life's most fascinating educations! As I read, I fondly remember my times at work typing on the the Wang, working in Bala Cynwyd at Software Design International, commuting to Valley Forge to work for Users, Inc. The early 80's were exciting times! Thanks for this website!